According to the Regional Bureau of Statistics, in 2017, 94 forest fires consumed an area of 1,570 hectares, of which 658 hectares of forest stands). According to the same source, in 2016, the number of fires had been lower (54), but the extent of burning was higher (6,270 ha). 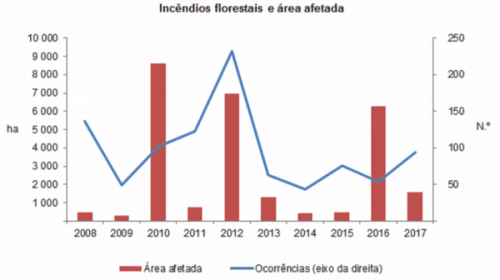 On another topic, in terms of precipitation, the same source indicates that the “amount of precipitation was lower than the previous year, either in Funchal (377 mm in 2017 against 647 mm in 2016) or in Porto Santo (367 mm in 2017 against 498 mm in 2016) “. Regarding temperatures, in Funchal, “the average maximum temperature in 2017 was 23.4ºC (23.0ºC in 2016), while in the case of minimum temperatures, the average was 17.8ºC (17.4ºC in 2016) ).